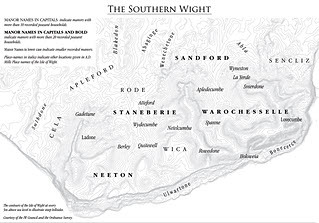 Excerpts from the book Discovering Domesday Wight by John Medland. 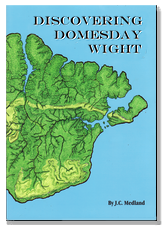 This page includes all Isle of Wight entries in the Domesday Book, together with a range of associated maps. At Christmas 1085 William the Duke of Normandy, who had conquered the Kingdom of England in 1066, called a national council at Gloucester Castle. 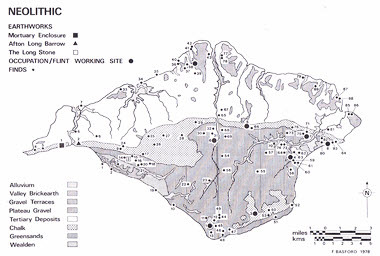 The Council of Gloucester ordered a land survey to establish who owned what and what it was worth. In the summer of 1086 two commissioners visited each manor and asked the same question of local people. The information was passed up to be recorded in 'hundreds' of manors and 'shires', and eventually into a two volume record covering almost all of the kingdom. The commissioners recorded a comprehensive collection of statistical detail. This accounts for the despairing conquered English calling it the 'Domesday Book'. The king holds KNIGHTON and "DONE" in demesne. 8 free men held them of King Edward in alod. They then paid geld for 2 hides; now for nothing. 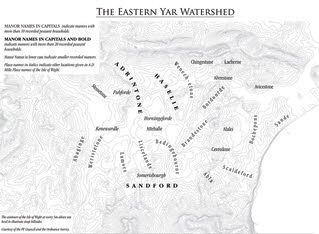 Oda, with 2 free men, had half a hide and the fourth part of a virgate, Alweald 1 virgate, Harold 1 virgate, Godwine 1 virgate, Alric 1 virgate [and] Beorhtric half a hide. Each of these [had] part of a mill, each part [rendering] 22d. The land of these 5 [sic] thegns the king holds in his farm; and there he has 2 ploughs in demesne, and it is valued at 100s and yet it renders £8 at farm. What Oda held [is worth] 11s; what Alweald [held] 5s; what Harold [held] 5s. 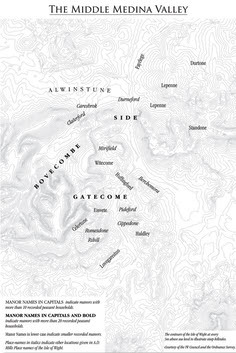 The king holds "LADONE" and BATHINGBOURNE in demesne. Oda held them of King Edward in alod. They then paid geld for four hides, and now for half a hide. There is land for three ploughs. The king holds them in his farm. Oda had £4 at farm. The king holds SANDFORD WITH WEEK in demesne. King Edward held them. [There were] then 3 hides. When the sheriff received them [there were] 2 hides and 1 virgate. There is land for 12 ploughs. In demesne are 3 ploughs; and 10 villans and 3 bordars with 6 ploughs. There are 10 slaves, and 2 mills rendering 70d. and 6 acres of meadow. From the herbage, 20s. [There is] woodland without pannage. TRE [it was worth] £25 weighed and assayed; when the king received it, £20 [measured] in the same way; and now £20 by weight; and yet it renders at farm £26 by weight and 100d. The king holds ARRETON in demesne. King Edward held it. There are 4 hides. There is land for 5 ploughs. In demesne are 3 ploughs; and 10 villans and 12 bordars. There are 7 slaves, and 1 mill rendering 15s. The Abbey of Lyre holds the church of this manor, with 1 virgate of land and 1 acre of meadow, and all the tithe of the manor; and it is valued at 20s. The whole manor was worth £10 and afterwards, as now £8; yet it renders £12 blanch and [20d] to the ora. 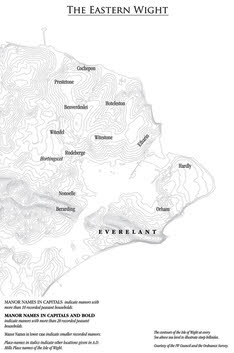 The king holds YAVERLAND in demesne. King Edward held it. It was not assessed in hides. There is land for 5 ploughs. There are 12 villans with 5 ploughs. TRE it was worth 100s; and afterwards, as now £4; yet it renders 100s. The king holds "ABEDESTONE" [in Ryde] in demesne. 3 free men held it of King Edward in alod. It then, as now, paid geld for 1 hide. There is land for 3 ploughs. There are 11 villans with 4 ploughs. It is and was worth 40s; yet it renders 60s blanch. The king has a plot of land in the island, from which come 6 ploughshares. The king holds "SCALDEFORD" in demesne. Seaweard held it in alod of King Edward. It paid geld then, as now, for half a hide. There is land for one plough. There are 3 villans with 11/2 ploughs. It is and was worth 13s; yet it renders 16s8d. The king holds LESSLAND in demesne. 5 free men held it in alod as five manors of King Edward. It paid geld then for 1 hideand half a virgate; now for half a hide and half a virgate. Aelmer had half a hide, Wulfnoth half a virgate, Swaerting half a virgate, Wudumann half a virgate [and] Godmann 1 virgate. There is land for 2 ploughs. There are 4 villans having 21/2 ploughs in demesne, and 5 acres of meadow. It is and was worth 20s. The king holds LUCCOMBE. Saewine held it of King Edward in alod. It then paid geld for 1 hide; now for 2 parts of a virgate. There is land for 1 plough, and there is [1 plough] in demesne, with 6 bordars and 2 slaves. TRE it was worth £4; and afterwards, as now, £3; yet it renders £4 at farm. The king holds NUNWELL. Wulfflaed held it of Earl Tosti but it was not an alod. It then paid geld for 2 hides; now for 1 virgate. There is land for 11/2 ploughs. In demesne there is  plough; and 1 villan and 2 bordars with half a plough, and 3 slaves. TRE it was worth 60s; and afterwards, as now, 40s; and yet it renders a blanch farm. The king holds KERN. Earl Harold held it. It then paid geld for 1 hide; now for nothing. There is land for 1 plough and there is [1 plough] in demesne, with 2 bordars and 5 slaves. TRE it was worth 25s; and afterwards, as now, 20s. The king holds 'WOOLVERTON' [in Bembridge]. Eadgifu held it of Earl Godwine. It then paid geld for half a hide; now for nothing. There is land for 1 plough, and there is [1 plough] in demesne, with 3 bordars and 1 slave. It is and was worth 10s. The king holds SANDOWN. Wulfnoth held it of King Edward in alod. It then paid geld for 2 hides; now for half [a hide] and half a virgate. There is land for 3 ploughs. In demesne is 1 plough; and 7 villans and 1 bordar with 3 ploughs, and 4 acres of meadow. It was worth 40s; now 30[s]. The king holds WROXALL. Countess Gytha held it of Earl Godwine in alod. It then paid geld for 5 hides; now for 21/2 hides. There is land for 10 ploughs. In demesne are 4 ploughs and 10 villans and 24 bordars with 7 ploughs. There are 17 slaves, and 2 mills rendering 20s, and 3 acres of meadow, [and] woodland for 1 pig. TRE it was worth £27; and afterwards, as now, £20; yet it renders £22. The king holds HEASLEY. Earl Harold held it. It then paid geld for 3 hides; now for 11/2 virgates. There is land for 4 ploughs. In demesne there are 2 [ploughs]; and 4 villans and 4 bordars with 2 ploughs. There are 15 slaves, and 10 acres of meadow, [and] woodland for 2 pigs. TRE it was worth £8; and afterwards, as now, 100s; yet it renders at farm £8 at 20[d] to the ora. The king holds BARNSLEY. Godwine held it of King Edward in alod. It then paid geld for 1 hide; now for half a hide and half a virgate. There is land for 2 ploughs. There are 3 villans with 1 plough. [There is] woodland for 1 pig. It was worth 40s; now 20s. The king holds PUCKPOOL and "ETHARIN". 2 free men held it of King Edward as 2 manors in alod. It then paid geld for 1 hide; now for 3 virgates. There is land for 1 plough, and there is [1 plough] in demesne, with 3 villans. It was worth 30s; now 20s; yet it renders 30s. The king holds NETTLESTONE. Alnoth held it of King Edward in alod. It then paid geld for the third part of a hide; now for half a virgate. There is land for half a plough, and there is [half a plough] in demesne, with 3 bordars. It was worth 10s; now 5s. The king holds STENBURY and WHIPPINGHAM. Cypping held it of King Edward as 2 manors in alod. It then paid geld for 3 hides; now for 2 hides. There is land for 7 ploughs. In demesne are 2 [ploughs]; and 7 villans and 10 bordars with 6 ploughs. There are 12 slaves, and 5 acres of meadow. It is and was always worth £12. The king holds "WENECHETONE". 2 free men held it of King Edward as 2 manors in alod. It then paid geld for 1 hide; now for nothing. There is land for 2 ploughs, and there are [2 ploughs] with 2 villans. It was and is worth £3. Yet from these 2 manors comes at farm £18 at 20[d] to the ora. 1 virgate of this land is in 'Shoofleet' [in Whippingham]. Bolla held this of King Edward in alod. The king has it now in his farm. The king holds NITON and "ABLA". 2 free men held it as 2 manors of King Edward in alod. It then paid geld for 3 hides; now for 1 hide and 1 virgate. There is land for 8 ploughs. In demesne are 3 ploughs; and 7 villans and 18 bordars with 5 ploughs. There are 9 slaves. TRE it was worth £17; and afterwards, as now, £12; yet it renders £17. The king holds WOOTTON. Queen Edith held it. It then, as now, paid geld for 1 hide. There are 4 villans with 3 ploughs. It is worth, and renders, £3. King WILLIAM holds BROOK in demesne. Earl Tosti held it. [It was] then [assessed] at 3 hides; now at 1 hide. There is land for 6 ploughs. In demesne are 2 ploughs; and 3 villans and 7 bordars with 21/2 ploughs. There are 9 slaves, and a mill rendering 15d, and 6 acres of meadow. TRE it was worth £7; and afterwards £6; now £7; and yet it renders £7 more. The king himself holds COMPTON in demesne. Earl Tosti held it. It was then assessed at 3 hides; now at 1 hide. There is land for 4 ploughs. In demesne is 1 [plough]; and 7 villans and 3 bordars with 2 ploughs. There is 1 slave, and 2 acres of meadow. TRE it was worth £6; and afterwards, as now, 100s; yet it renders 60s. more. The king himself holds AFTON in demesne. Earl Tosti held it. [It was] then [assessed] at 4 hides; now at 3 hides less 1 virgate. There is land for 8 ploughs. In demesne are 2 [ploughs]; and 14 villans and 8 bordars with 6 ploughs. There are 12 slaves, and 6 acres of meadow. TRE it was worth £10; and afterwards, as now, £8; yet it renders £10. The king himself holds WELLOW in demesne. Cuthwulf held it in parage from the king. [It was] then [assessed] at 2 hides; now at 3 virgates. There is land for 4 ploughs. In demesne are 2 [ploughs]; and 6 villans and 3 bordars with 11/2 ploughs. There are 4 slaves, and 6 acres of meadow. TRE as afterwards, as now, worth £10; yet it is at farm for £15. The king himself holds FRESHWATER in demesne. Earl Tosti held it. It was then assessed at 15 hides; now at 6 hides. There is land for 15 ploughs. In demesne are 2 ploughs; and 18 villans and 10 bordars with 8 ploughs. There are 7 slaves, and 6 acres of meadow. TRE it was worth £16; and afterwards £20; yet it is at form for £30. Of these 15 hides the Abbey of Lyre holds 3 virgates, and William fitzAzor 1 hide. The same king holds WILMINGHAM in demesne. Wulfgeat the huntsman held it in parage. Then, as now, [it was assessed] at 1 hide. There is land for 1 plough. There are three villans with 2 ploughs, and half an acre of meadow. It is and was worth 20s. Of this manor of the king Reginald fitzCroch holds 1 virgate, and says Earl Roger gave it to his father. It was worth 5s; now it is waste. The king himself holds BOWCOMBE in demesne. It belonged to King Edward's farm. It was then assessed at 4 hides; now at nothing. There is land for 15 ploughs. In demesne are 3 ploughs; and 25 villans and 15 bordars with 15 ploughs. There are 10 slaves, and 8 acres of meadow, and a mill rendering 40d. From a toll, 30s, and [there is] a salt pan without rent, [and] woodland for 5 pigs. Of the land of this manor William fitzStur holds half a virgate. There is 1 plough with 1 villan. It is worth 10s. Joscelin and William his brother hold 1 virgate, which before them rendered rent; but these men have not paid it. The monks of Lyre hold the church of this manor, with 1 virgate of land. Of this virgate of land Humphrey holds a portion where he has 8 men paying 5s, and William fitzAzor 21/2 acres where he has 4 houses. They hold without the consent of the priest. There belong to this church 20 bordars messuages, and they render 14s. There is a mill rendering 6s, and all the tithes of Bowcombe belong to this church. The whole, TRE and afterwards, as now, worth £20; what the abbot has, £4. The same king holds 'HALDLEY' [in Carisbrooke] in demesne. Cypping held it of King Edward. It was then assessed at 6 virgates less 1 ferding. There is land for 3 ploughs. In demesne is 1 [plough]; and 4 villans and 1 bordar have 2 ploughs. [There is] woodland for 2 pigs, and 5 slaves. It is worth £3. The king himself holds LUTON. Wulfgeat the huntsman held it in parage. [It was] then [assessed at 1 hide; now at half [a hide]. There is land for 2 ploughs. There 4 villans and 2 bordars have 2 ploughs. There are 2 slaves, [and] woodland for fencing. It is and was worth 20s. The same king holds SHIDE. Ketil held it in parage. [It was] then [assessed] at 1 ½ hides; now at 1 [hide] only. There is land for 4 ploughs. In demesne is 1 [plough]; and 5 villans and 8 bordars with 3 ploughs. There is 1 slave, and 4 mills rendering 12s6d, and 4 acres of meadow, [and] woodland for fencing. It is and was worth £4. William fitzStur pays for these aforesaid 4 manors £60, although they are worth less. The same king holds SHORWELL. Three thegns held it in parage, and they had 3 halls. [It was] then [assessed] at 1 ½ hides; now at 3 virgates. There is land for 3 ploughs. In demesne are 1 ½ ploughs; and 2 villans and 8 bordars with 1 plough. There are 6 slaves [and] woodland for fencing. It is and was worth £4. The same king holds 3 manors, ATHERFIELD [Atherfield and Atherfield Green], DUNGEWOOD, [and] WALPAN. 3 thegns held them. [They were] then [assessed] at 3 hides; now at 1 hide. There is land for three ploughs. In demesne are 2 [ploughs]; and 1 villan and 10 bordars with 2 ploughs. There are 4 slaves, and 6 acres of meadow. It is and was worth £3; yet it renders £7. The same king holds KINGSTON. Wulfric held it in parage. [It was] then [assessed] at 1 hide; now at 1 virgate. There is land for 2 ploughs. There 6 bordars have 1 plough. There are 4 acres of meadow. It is and was worth 20s; yet it renders 30s. The same king holds ALVINGTON. Dunna held it. [It was] then [assessed] at 2 ½ hides; now at 2 hides, because the castle stands on 1 virgate. There is land for 6 ploughs. There are 8 villans and 2 bordars with 4 ploughs. There are 2 mills rendering 5s, and 6 acres of meadow. It is and was worth £3; yet it renders £4. 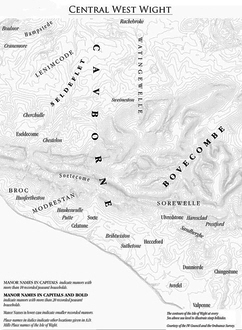 IN CALBOURNE HUNDRED WHICH LIES IN BOWCOMBE HUNDRED. II. WALKELIN, Bishop of Winchester, holds CALBOURNE in demesne. It always belonged to the monastery. There are 32 hides; but it only paid geld TRE, as now, for 17 hides. There is land for 25 ploughs. In demesne are 6 ploughs; and 27 villans and 15 bordars with 14 ploughs. There are 11 slaves, and 2 mills rendering 6s3d, and 8 acres of meadow, [and] woodland for 20 pigs. Of this land Robert holds 6 hides, and Alsige 3 ½ hides. 7 alodiaries held these hides of the bishop, and could not withdraw elsewhere or from him. There are 3 ½ ploughs and 3 villans and 22 bordars with 5 ploughs. There are 12 slaves, and 15 acres of meadow. Mauger holds the church of this manor, with half a hide, and there he has 1 plough with 1 bordar. The whole manor, TRE and afterwards, was worth £16. Now what the bishop has [is worth] £30; and yet it is at farm for £40, but it cannot bear nor render it. What the men hold [is worth] £7; [what] the church [holds], 30s. ST NICHOLAS has of King William 1 hide in SHALCOMBE. Alwine Forst held it. It was then assessed at 1 hide; now at nothing. There is land for 2 ploughs, and there are [two ploughs] in demesne, with 1 bordar. It was worth £4; now £3. 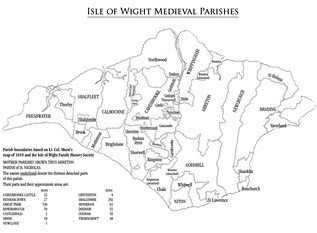 The Abbey of SAINT-MARIE of Lyre has in the Isle of Wight 6 churches, to which belong 2 hides and 2 ½ virgates of land; and in various manors they have 5 villans, who hold 1 ½ hides less the fourth part of a virgate. They have the tithes of all the king's revenues. All that they have is valued at £20. It pays geld for 2 hides and half a virgate of land. 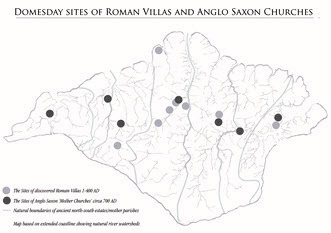 THE ABBEY of Wilton holds [Lower and Upper] WATCHINGWELL. It always belonged to the monastry. TRE it was assessed at 3 hides; now at 2 ½ hides, because half [a hide] is in the king's park. There is land for 8 ploughs. There 7 villans and 12 bordars have 5 ploughs. There is a saltpan without rent, [and] woodland for 2 pigs. The meadow is in the park. It is and was worth £3; what the king has [is worth] 5s. William fitzStur holds CHALE in demesne of the king. Ketil was (sic) in parage. [It was] then [assessed] at 1 hide; now at 1 virgate. There is land for 1 plough, and there is [1 plough], with 4 bordars having 1 plough. There are 4 slaves, and 1 acre of meadow. TRE, as now, worth 40s; when received, 20s. The same William holds GOTTEN. Bruning and his brother held it in parage. It was then, as now, assessed at 1 hide. There is and for 1 plough. There is [1 plough], with 2 bordars and 3 acres of meadow. It is and was worth 20s. The same William holds [Great, North or Upper] APPLEFORD, and Robert [holds] of him. Ketil held it in parage. It was then, as now, assessed at one hide. There is land for 2 ploughs. In demesne is half a plough; and 3 bordars with 1 plough. There are 4 acres of meadow. It was worth 17s; now 18s. The same William holds GATCOMBE. 3 brothers held it in parage of King Edward. It was then assessed at 2 hides; now at 1 hide. Each had a hall. There is land for 4 ploughs. In demesne are 3 ploughs; and 6 villans and 15 bordars with 5 ploughs. There are 6 slaves and a mill rendering 40d. There are 26 acres of meadow, [and] woodland for fencing. TRE, as now, worth £6; when received, 100s. The same William holds GREAT WHITCOMBE. Godric held it in parage. [It was] then [assessed] at 1 hide; now at nothing. There is land for 1 plough. There is [1 plough] in demesne, with three bordars, and 2 ½ acres of meadow. It was worth 10s; now 15s. The same William holds CALBOURNE. Bolla held it on parage. It was then assessed at 3 hides less half a virgate; now at 1 ½ virgates. There is land for two ploughs. In demesne are 2 ploughs; and 1 villan and 3 bordars with 1 plough. There are 3 slaves, and a mill rendering 5s, and 2 ½ acres of meadow, [and] woodland for fencing. TRE and afterwards, it was worth 30; now 40s. The same William holds WOLVERTON, and Juran [holds] of him. He himself held it in parage of King Edward. It was then, as now, assessed at 1 hide. There is land for 1 plough, and there is [1 plough] with 1 villan and 2 bordars, and a mill rendering 35d, and ½ an acre of meadow. It is and was worth 10s. The same William holds half a hide in [? Little] ATHERFIELD, and Travers holds of William. Wulfgeat held this in parage. It was then, as now, assessed at half a hide. There is land for 1 plough, and there is [1 plough] in demesne, with 1 bordar, and 1 ½ acres of meadow. It is worth 10s. The same William holds CHEVERTON, and Humphrey holds of him. Thorkil held it in parage. [It was] then, as now, [assessed] at 1 hide. There is land for 1 ½ ploughs. In demesne is 1 [plough]; and 3 villans and 1 bordar with 1 plough. [There is] woodland for fencing. It was worth 20s now 30s. In the same place, the same William has of the king 1 villan with half a virgate of land, and 1 ½ acres of land which Reginald the baker held of Earl William. The earl's bakehouse was there. It is worth 16; the villan pays 10s a year. William fitzStur himself holds 'HARDLEY' [in Brading]. Godric held it of King Edward in Alod. It was then assessed at 1 hide; now at half a virgate. There is 1 plough; and 3 bordars with half a plough, and 8 slaves. [There is] a small wood without pannage. It is and was worth 40s. The same William holds "ORHAM". Godric held it of King Edward in alod. It then paid geld for half a hide; now for 1 virgate. There is land for 1 plough. In demesne there are 1 ½ ploughs and 5 bordars with half a plough. It was worth 40s; now 20s. The same William holds WHIPPINGHAM. Bolla held it of King Edward in alod. Then, as now, it paid geld for 1 hide. There is land […]. In demesne is half a plough; and 3 villans and 2 bordars with 1 plough. It is and was worth 10s. The same William holds WHITEFIELD [Whitefield or Little Whitefield], and Reginald [holds] of him. Ketil held it of King Edward in alod. Then, as now, it paid geld for 1 hide. There is land […]. In demesne is 1 plough; and 1 villan and 3 bordars and 1 slave with half a plough. There is salt-pan rendering 14s8d, and 1 acre of meadow. It is worth 20s. The same William holds another WHITEFIELD [Whitefield or Little Whitefield]. Godric held it of King Edward in alod. It then paid geld for 3 hides; now for 1 hide. There is land for 6 ploughs. In demesne are 4 ploughs; and 4 villans have 3 ploughs. There are 3 mills rendering 11s, and 8 aces of meadow. TRE it was worth £4; and afterwards £3; now £7. The same William holds HALE, and Nigel [holds] of him. Godric held it of King Edward in alod. It then, as now, paid geld for half a hide. There is land for 1 plough. In demesne is 1 [plough]; and 1 villan and 4 bordars with 1 plough, and 4 acres of meadow. It is worth 10s. The same William holds BINSTEAD. Tovi held it as a manor of King Edward in alod. It then paid geld for 5 virgates; now for 2 virgates. There is land for 2 ploughs. There are [2 ploughs] with 2 villans. It is and was worth 10s. The same William holds MERSTON and Humphrey [holds] of him. Beorhtwine held it of King Edward in alod. It then, as now, paid geld for half a hide. In demesne is 1 plough, with 1 villan. It is and was worth 10s. The same William holds PRESTON. Tovi held it of King Edward in alod. It then, as now, paid geld for 2 hides and 1 ½ virgates. There is land for 1 plough. There are 8 villans with 1 plough, and 4 acres of meadow, and a fishery for the hall. [There is] woodland for 1 pig. It is and was worth 20s. The same William holds [Great of Little] EAST STANDEN, and Humphrey [holds] of him. Bolla held it of King Edward. It then, as now, paid geld for 1 ½ hides. There is land […]. In demesne is 1 plough; and 2 villans and 3 bordars with 1 plough. It is and was worth 20s. The same William holds ALVERSTONE, and Tovi, holds of him. He himself held it of King Edwward. It then, as now, paid geld for 1 hide. There is land for 2 ploughs. There is 1 bordar, and a mill rendering 40d. It was worth 20s; now 5s. 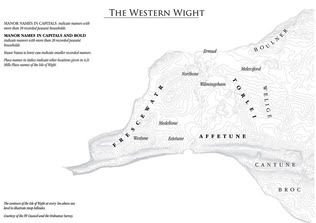 William fitzAzor holds BONCHURCH [Bonchurch and Upper Bonchurch] of the king. Aestan held it of Earl Godwine in alod as a manor. It then paid geld for 1 virgate, now for nothing. There is land for half a plough. There are 3 bordars. TRE it was worth 30s; and afterwards, as now, 20s. The same William holds LOVERSTON. 2 free men held of King Edward in alod. It then paid geld for half a hide; now for 1 virgate. There is land for 1 plough and there is [1 plough] with 9 bordars. It was worth 40s now 30s. The same William holds [Great or little] EAST STANDEN. 2 free men held it of King Edward in alod. It then paid geld for 5 virgates; now for 1 virgate. There is land for 2 ploughs. In demesne is 1 plough with 1 bordar. Of this land a certain Peveral holds half a virgate, and there he has 1 plough. TRE it was worth 30s; and afterwards 15s; now the demesne of William [is worth] 40s; of Peverel 10s. The same William holds GREAT BRIDDLESFORD, and Nigel [holds] of him. Olaf held it of King Edward in alod. It then, as now, paid geld for 1 hide. There is land for 4 ploughs. In demesne is 1 [plough]; and 5 villans and 5 bordars with 4 ploughs. It was worth 20s; now 40s. The same William holds YAVERLAND. Almaer and Swaerting held it of King Edward in alod. It then paid geld for 3 hides; now for 1 virgate. There is land for 3 ploughs. In demesne is 1 plough with 8 bordars, and a mill rendering 12s. There are 1 ½ acres of meadow. It was worth £3; and afterwards £4; now 100s. The same William holds SHANKLIN. Algar held it of King Edward. It then paid geld for 1 hide; now for three virgates. There is land for 1 plough. In demesne is half a plough; and 3 villans and 2 bordars and 2 slaves with 1 plough. [There is] woodland for 2 pigs. TRE, as now, worth 40s; when received 20s. The same William holds BRADING, and his nephew holds of him. Alnoth held it as a manor of King Edward I alod. It then, as now, paid geld for 3 parts of a virgate. There is land for half a plough. In demesne is 1 plough, with 4 bordars, and 1 acre of meadow. [There is] woodland for 2 pigs. It as worth 10s; now 20s. The same William holds BORTHWOOD, BRANSTONE and LESSLAND. 2 free men [held them] as 2 manors of King Edward in alod. Then as now they paid geld for 1 hide and 1 virgate. There is land for 2 ploughs; and it is [now all] in one manor. In demesne [is] 1 villan and 2 bordars with half a plough, and 2 acres of meadow. Of this land, William's nephew holds 1 virgate, and Peverel [holds] half a hide and 1 virgate. The whole TRE was worth 30s; and afterwards 20s; now 16s. The same William holds 10 acres in BLACK PAN, and there is 1 bordar. It is worth 3s. The same William holds "SCALDEFORD". Asgot held it of King Edward in alod. Then, as now, it paid geld for 1 virgate. There is land for 1 plough, and there is [1 plough], with 3 villans. [There is] woodland for 2 pigs. It was worth 16s now 10s. The same William holds "WITESTONE", and William and Richard [hold] of him. Almaer held it of King Edward in alod. It then, as now, paid geld for 1 hide. There is land for 2 ploughs. In demesne is 1 [plough], with 3 villans. It was worth 30s; now 20s. The same William holds BARNSLEY, and Roger [holds] of him. Wulfnoth held it of King Edward. Then, as now, it paid geld for half a hide. There is land for 1 plough. There is 1 bordar. It was worth 10s; now 7s. The same William holds ROWBOROUGH. The Abbot of Winchester held it from King Edward in alod. Then, as now, it paid geld for 1 virgate. There is land for 1 plough. There is [1 plough] in demesne, with 1 villan and 2 bordars and half a plough. It was worth 5s; now 20s. The same William holds MOOR, and Ansketil [holds] of him. 3 free men held it of King Edward. It then, as now, paid geld for half a hide. There is land for 1 plough. In demesne is 1 plough; and 5 bordars with half a plough. It was worth 30s; now 20s. The same William holds ADGESTONE. Godric held it of King Edward in alod. It then, as now, paid geld for 1 virgate and the third part of 1 virgate. There is land for 1 plough. A certain vavasour, having 2 cows, dwells there. It is and was worth 10s. The same William has a certain plot of land in the island, from which come 3 ploughshares. Joscelin fitzAzor holds "SCALDEFORD" of the king. Asgot held it of King Edward in alod. Then, as now, it paid geld for 1 virgate. There is land for 1 plough, and there is [1 plough] in demesne. Azor holds it of Joscelin. TRE it was worth 40s; and afterwards 20s; now 30s. The same Joscelin has a plot of land in the island from which come 3 ploughshares. The same Joscelin holds ROUD. Alnoth held it of King Edward in alod. It then paid geld for 3 hides; now for 5 ½ virgates of land. There is land for 6 ploughs. In demesne are 2 ploughs; and 6 bordars and 4 slaves with 1 plough, and 4 acres of meadow. Of this manor, Azor holds 1 virgate, and Saewine half a hide and the fourth part of a virgate, and Nigel 3 parts of a virgate. In demesne is 1 plough; and 1 villan and 2 bordars with 1 plough. The whole TRE was worth £9; and afterwards £8; now £8.10s. The same Joscelin holds SHANKLIN. 6 free men held it of King Edward in alod. It then paid geld for 3 ½ hides; now for 5 ½ virgates of land. There is land for 5 ploughs. In demesne are 2 ploughs; and 4 villans and 2 bordars and 2 slaves with 2 ploughs. Of this manor Livol holds 1 hide, and there he has 2 bordars with half a plough. The whole TRE was worth £8; and afterwards £6; now £7. The same Joscelin holds holds [?] BRIGHSTONE. 3 free men held it of King Edward in alod. Then as now it paid geld for 2 hides and 3 virgates and the third part of a virgate. There is land for 4 ploughs. 4 men, William, and another William, Geoffery, and Douenold, hold this land of Joscelin. There is 1 plough in demesne. The whole TRE was worth 100s; and afterwards, as now, amongst them all, 50s. Joscelin himself holds SHIDE of the King. Eadnoth […] held it of King Edward. It was then assessed at 2 hides less 1 virgate; now at 1 ½ hides. There is land for 4 ploughs. In demesne is 1 plough; and 3 villans and 2 bordars with 1 ½ ploughs. There are 3 slaves, and 2 mills rendering 5s, and 2 acres of meadow. TRE, as now, worth 50s; when received, 40s. The same Joscelin holds 1 virgate in CHILLERTON, and Geoffrey holds it of Joscelin. Blaecmann held it in parage. [It was] then, as now, [assessed] at 1 virgate. There is land for 1 plough, and there is [1 plough] in demesne. It was and is worth 10s. The same Joscelin holds SHORWELL. Wulfnoth held it in parage. [It was] then [assessed] at 2 hides and 1 virgate; now at half a hide. There is land for 2 ½ ploughs. In demesne is 1 [plough]; and 2 villans and 6 bordars with 1 ½ ploughs. There are 3 slaves, and a mill rendering 40d, and 14 acres of meadow. TRE, and afterwards, it was worth 100s; now £4. The same Joscelin holds SHALFLEET. Eadric held it TRE, and it was then assessed at 6 hides; now at 3 hides and half a virgate. There is land for 14 ploughs. In demesne are 2 [ploughs]; and 14 villans and 19 bordars with 9 ½ ploughs. There is a mill rendering 11d, and 4 acres of meadow. There is a church, [and] woodland for 20 pigs. Of this land, Geoffrey holds 2 ½ virgates, and there is 1 plough with 2 villans and 1 bordar; and Turgis half a hide, Leof 1 hide, Leof 1 hide. These have two ploughs in domain and 2 villans and 2 bordars with half a plough. The whole, TRE and afterwards, was worth £20; now £15 amongst them all. The same Joscelin holds HAMPSTEAD. Aelfric held it in parage. [It was] then, as now, [assessed] at half a hide. There is land for 1 plough. There are 2 slaves with 1 villan with half a plough. It is and was worth 20s. The same Joscelin holds WOLVERTON. Aelfric held it in parage. [It was] then, as now, [assessed] at 1 hide. There is land for two ploughs. In demesne are 1 ½ [ploughs]; and 1 villan and 3 bordars with 1 plough. There are 4 slaves and 1 acre of meadow. It is and was worth 60s. Turold holds it of Joscelin. The same Joscelin has half a hide in CHILTON. Aelfric held it, and it was then, as now, [assessed] at 1 hide. There is land for 1 plough, and there is [1 plough], with 2 villans, and 4 acres of meadow. It is and was worth 10s. ALSO WILLIAM fitzAzor holds MOTTISTONE of the king. 4 thegns held it in parage. [It was] then [assessed] at 2 hides; now at 2 ½ virgates. There is land for 4 ploughs. In demesne is 1 plough and seven slaves; and 7 bordars with 1 plough, and 16 acres of meadow. TRE it was worth £10 and afterwards as now, £6. The same William holds COOMBE. Lyfing held it in parage. [It was] then [assessed] at 1 hide; now at half a virgate. There is land for 1 plough. There are 2 bordars and 2 slaves, and a mill and 2 acres of meadow. It is worth 40s. The same William holds half a hide in HAMPSTEAD, and Nigel [holds] of him. Aelfric held it in parage. [It was] then, as now, [assessed] at half a hide. There is land for 1 plough, and there is [1 plough] with 2 villans and 2 bordars. It is and was worth 20s. The same William holds half a hide in CHILTON, and William Foristn [holds] of him. Aelfric held it in parage. It was then, as now, assessed at half a hide. There is land for 1 plough. It was worth 10s; now 5s. The same William holds 1 hide and 1 virgate in SHIDE. Eadnoth held it in parage. [It was] then [assessed] at 5 virgates; now at 3 virgates. There is land for 3 ploughs. In demesne [is] nothing; but [there are] 15 bordars and 4 slaves with 1 ½ ploughs. There is a mill rendering 10s and 2 acres of meadow, [and] woodland for fencing. TRE, and afterwards, it was worth 40s; now 60s. The same William holds in FRESHWATER 1 hide, and it pays geld for as much, and Roger [holds] of him. A certain reeve of Tosti held this in the manor of Freshwater. There is land for 1 plough, and there is [1 plough] in demesne, with 3 bordars. TRE, as now, worth 40s; when received 20s. The same William holds in CHILLERTON 1 virgate, and it is assessed at as much, and Geoffrey [holds] of him. Blaecmann held it in parage. There is land for 1 plough, and there is [1 plough] in demesne, with 2 bordars and 1 slave. It was worth 20s; now 30s. GODRIC the priest holds "MELUESFORD" of the king. He himself held it of King Edward in parage. [It was] then, as now, [assessed] at 1 hide and ½ a virgate. There is land for half a plough. In demesne, however, is 1 plough with 1 bordar, and a mill without rent, and 1 ½ acres of meadow. It is and was worth 10s. ALSIGE son of Beorhtsige holds THORLEY. Earl Tosti held it. It was then assessed at 3 hides; now at 2 hides. There is land for 7 ploughs. In demesne are 2 [ploughs]; and 10 villans and 11 bordars with 6 ploughs. There are 7 slaves, and 6 acres of meadow. TRE, and afterwards, it was worth £8; now £12. AELFRIC holds and held 1 hide in SHEAT, and it is assessed at as much. There is land for half a plough. In demesne is 1 plough, and 2 slaves and 1 bordar, and a mill without rent. It was worth 10s; now 15s. WULFNOTH holds and held [?] 'LEA' [in Brading]. TRE, as now, it paid geld for 1 virgate. In demesne is half a plough. It is worth 5s; it was worth 7s. HERBRAND holds [Great and Little] PAN of the king. Godric held it of King Edward. It then, as now, paid geld for 1 hide. There is land for 4 ploughs. In demesne is 1 plough; abd 4 villans with 2 ploughs. There are 2 acres of meadow, [and] woodland without pannage. It was worth £4; now £3. EADRIC holds ADGESTONE. He himself held it of King Edward. It then, as now, paid geld for half a virgate. There is land for half a plough. The is [half a plough] in demesne, with 2 bordars and 2 slaves. It is and was worth 5s. OIRANT holds 'CHALCROFT' [in Brading]. His father held it of King Edward. It then, as now, paid geld for half a virgate. In demesne is half a plough, with 1 bordar. It is and was worth 5s. ALSIGE holds [?] BAGWICH of the king. He himself held it of King Edward in alod. It then, as now, paid geld for 1 virgate. There is land for half a plough. There is half an acre of meadow. It was worth 5s; now 3s. WULFHEARD holds WHIPPINGHAM of the king. He himself held it of King Edward in alod. It then, as now, paid geld for half a hide. In demesne is half a plough, with 3 bordars. It is and was worth 10s. ALRIC and his nephew hold NETTLESTONE of the king. They themselves held it of King Edward in alod. It then, as now, paid geld for the third part of a hide. There is land for half a plough, and there us [half a plough] in demesne. It is and was worth 5s. HUMPHREY holds the third part of a hide in NETTLESTONE of the king. Godeza held it of King Edward in alod. It then, as now, paid geld for the third part of a hide. There is land for 3 ploughs. In demesne is 1 plough and 2 acres of meadow. It was worth 60s; now20s. EADWIG holds [Great, North or Upper] APPLEFORD. He himself held it of King Edward in alod. It then, as now, paid geld for half a hide. There is land for 1 plough. In demesne is half a plough, with 1 bordar, and 2 ½ acres of meadow. It was worth 20s; now 10s. SWAERTING holds DURTON of the king. He himself and another free man held it of King Edward in alod. It then paid geld for 1 ½ hides, less the third part of a virgate. 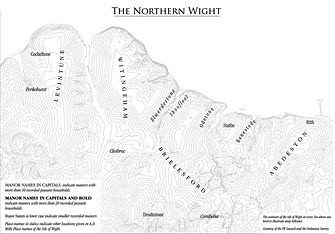 […] In demesne is half a plough; and 1 villan and 1 bordar with 1 plough. Of this manor, William holds at farm 2 parts of a hide and there he has 1 plough. It was worth 32s; now 42s. GODRIC holds 'HUFFINGFORD' of the king. He himself held it of King Edward. It then, as now, paid geld for 1 virgate. There 1 villan has half a plough. It is worth 40d. TOVI holds, as a gift of the king, half a virgate in KNIGHTON. Bondi held it King Edward in alod. It then, as now, paid geld for half a virgate. There is 1 villan. It is and was worth 3s. AELFRIC and Wihtlac have 1 hide and 2 ½ virgates in YARMOUTH. This themselves held it in parage of King Edward. It was then, as now, assessed at 1 hide and 2 ½ virgates. There is land for two ploughs. There are 7 villans and 2 bordars having 2 ploughs. It was worth 12s now 25s. WULFNOTH and Bruning have half a hide in [?]SHATE. They themselves held it in parage. [It was] then, as now, [assessed] at half a hide. There is land for 1 plough. There 3 villans have 1 plough, and a mill rendering 40d, and 2 acres of meadow. It is and was worth 10s. GERIN has 1 hide in Ningwood. King Edward had it in his farm. [It was] then, as now, [assessed] at 1 hide. There is land for 4 ploughs. In demesne is 1 [plough]; and 6 villans and 10 bordars with 3 ploughs. There is half an acre of meadow, [and] woodland for fencing. It was worth £6; now £7. WULFSIGE holds half a hide in CHALE. He himself held it of King Edward in parage. [It was] then, as now, [assessed] at half a hide. There is land for 1 plough. In demesne is half a plough; and 2 bordars have half a plough, and [there is] 1 acre of meadow. It is worth 10s. GODRIC has half a hide of the king in 'HUFFINGFORD'. He himself held it TRE. It was then, as now, assessed at half a hide. There is land for 1 plough. In demesne is half [a plough], with 1 bordar, and a mill without rent, and 1 acre of meadow. It is and was worth 10s. ALNOTH holds 1 hide of the king in LUTON. He himself held it in parage TRE. [It was] then, as now, [assessed] at 1 hide. There is land for 1 plough. In demesne is half a plough, with 2 bordars. It was worth 10s; now 12s. WULFNOTH holds of the king half a virgate, and it was assessed at as much TRE, as now. There is land for half a plough. There is 1 bordar. It is worth 30d. AELFRIC and Wihtlac hold half a hide in YAFFORD, and it was assessed at as much TRE, as now. 4 alodiaries held it in parage. There is land for 1 plough. In demesne is half a plough; and 5 bordars have 1 plough, and [there is] half an acre of meadow. It is and was worth 10s. BOLLA holds of the king 1 virgate in [Great, North or Upper] APPLEFORD, and it was assessed as much TRE, as now. There is land for 1 plough, and there is [1 plough] in demesne with 3 slaves, and there are 5 acres of meadow. It is and was worth 10s.